- examine en_us language file (maybe others) for blank lines, remove as needed. Update will be released this weekend. Keep an eye out for it people. Version 3.2.4 is now available on Extend! Removed blank line at start of English en_US language file that caused headers to be sent early. Fixed undefined variable $data in frontEndFunctions.php on line 71. Should have been $post. Fixed undefined variable $data_edit in manage_custom_fields.php on line 283. The defining location has been moved outside of an 'if' condition and should be set all the time now. This should also fix Trying to get property of non-object. Fixed undefined variable $blog_data in adminFunctions.php on line 1049. This variable was not needed there and has been removed. Separator pipe ( | ) has been removed from the info line. If you really want it back, create a custom layout. The feature request for an externally editable CSS file has not been included in this update. Instead, it will be added to the next update. How do I show the blog posts in the div box I want? The plugin page (http://get-simple.info/extend/plugin/get...-blog/810/) lists version 3.2.4 but the actual version included in a zip-file (once I click on a button to download) is still 3.2.3 ... Please update! Thanks! Just downloaded and installed version 3.2.4. "NetworkError: 403 Forbidden - /plugins/blog/js/codemirror/lib/codemirror.js?v=1.0"
"NetworkError: 404 Not Found - //plugins/gs-blog/js/admin_js.js?v=1.0"
"NetworkError: 404 Not Found - //plugins/blog/js/admin_js.js?v=1.0"
Don't change the name of the blog file and folder, this creates big problems as noted in previous versions. Also, make sure to check file permissions. All files in the plugins folder should have read access at a minimum. Is there a way to force a blog count to display separate from # of recent posts: or a way to add pagecrumbs to view additional post? The issue I am having is related to the blog manager > post > Post Option > Photo Gallery Code: *This is missing the input field altogether although I can see the text label for it. So what happens is my galleries are not displaying the prettyPhoto lightbox. Please can someone help me out here as to a fix. (2014-08-20, 01:06:17)Scribbit Wrote: Is there a way to force a blog count to display separate from # of recent posts: or a way to add pagecrumbs to view additional post? I've just installed this but unfortuately no matter which page I go onto I always just get the blog homepage? Any ideas as to what the problem could be please? I'm running GS version 3.3.3. What is your server setup? Apache / IIS? What php version do you have? It was a permissions issue, I couldn't access it at first, so I went to my user permissions page and ticked all of the boxes for blog, thinking that would give me access, without realising that it actually blocks access. Is this a fork or derivative of mikeh's plugin ? You should mention that and give credit if so to avoid confusion. Website links were outdated. This has been fixed. Version 3.3.0 is now available on Extend! - Re-wrote show_settings_admin() function from scratch. - Removed settings that are no longer needed. Most tasks can now be completed by creating/modifying template file. - Created function blog_theme_layouts() which gets the list of available theme files. 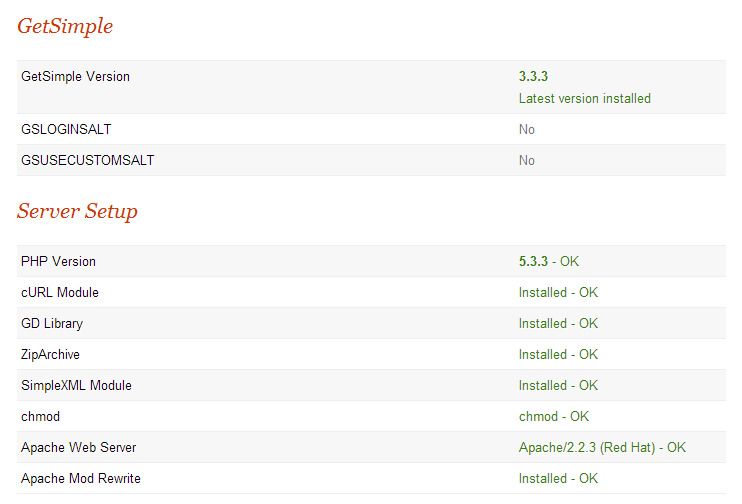 [#022] Added pluginManagementFA.js script : Adds icon to plugin's listing on the Plugin Management admin tab. [#021] Updated FontAwesome version to 4.2.0 and changed $media from 'screen' to 'print'. - Re-wrote show_blog_post() function from scratch. Old: 131 lines, New: 31 lines. [#003] Modified original layout to add scoped CSS functionality (New in HTML 5.1) : Backwards compatible with most current browsers. [#008] Fixed "Go Back" links in posts (sort of). The link is now in the template file. You can change it as needed, or remove it if you like. [#018] Removed social media functions. If you need this, add your own code to a template file. [#019] Moved some HTML sections of the code to separate files in 'html' folder to make for much easier reading and modification of code. [#027] Removed redundant CodeMirror files. [#020] Moved RSS Auto-Importer functions into it's own file. [#016] Added new strings to English en_US language file. [#026] Added new strings to Russian ru_RU language file. [#025] Added new strings to Italian it_IT language file. [#024] Added new strings to Spanish es_ES language file. [#041] New Polish pl_PL language file added. Hi guys.... i have two questions. How i can show specific category posts with the first 10 posts (new to old) with pagination? How i can show the posts from specific category jump posts like ... show MANAGERS third last post from this category ? For now say thanks for all support and patience. I'm really satisfied with this great plugins and getsimple, but i have found any issues, and he would be grateful they could help me. I'm using the last version getsimple 3.3.3, and gs-blog plugin 1.5 -->http://get-simple.info/extend/plugin/gs-blog/462/. The theme is "Inception". Thank you very much in advance, for this marvellous work.